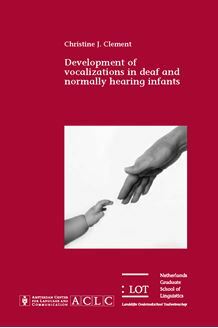 This thesis is an attempt to answer the question of whether vocalization development in infants is influenced by hearing and, if that is the case, from what age onwards. In order to be able to answer this question, we studied the vocalization development of two groups of infants; six deaf infants (with a hearing loss over 90 dB PTA) and six normally hearing infants. All infants were longitudinally studied in their first year of life. The vocalizations were studied with respect to several aspects, such as number of sound productions, utterance duration, voicing and types of consonant-like segments. The results of this study show that, already within the first months of life, deaf infants produce differences in their vocalizations with respect to several of these aspects. When relating these results to stages in vocalization development as found in normally hearing infants, such as babbling, we found that deaf infants produce some of these stages, although the emerge of some stages could be in a different order, delayed or even absent, compared to normally hearing infants. Moreover, the deaf infants produce some specific types of vocalizations that seem unrelated to the vocalization stages. The main conclusion of this thesis is that, already within the first half year of life, sound production is not solely determined by motor development and other maturational factors, but also by hearing. The results of this study have theoretical implications, as well as practical implications for early intervention programs for deaf infants.